Daughter of a Spider Queen. For now she plays exactly like Webber. Any bugs you find or ideas you might have. Feel free to post em. Hey folks, this mod has not been tested on Don't Starve and will recieve no support for it. In the future this character has to be unlocked by Webber! Maaaan, I can't edit the main post. Anyway - here are some known issues. This is a very cool idea! Although, Is it allowed to have a character exactly like Webber, because you normally have to pay to get RoG which gets you Webber? Just a thought. I will probably be downloading this Mod either way! Actually, you have a point. I'm kinda on the fence whether to applaud it, or to report it for deliberately being Webber. 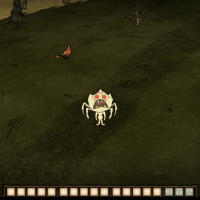 I don't know if this works with Don't Starve. If any of you want me to fix this, get a dev to give the okay. Or try again later when I have uploaded a newer version. At this point in time I only support Reign of Giants. Seems great so far, I'll give it a try. I think you should really rename it to something starting with a W, so it ties into the game better. What do you mean by "Infatuated with Webber"?